Info "Get in some barks, then some bites!" Officer K-9 is one of Kat and Ana's microgames, found in WarioWare: D.I.Y. Showcase. 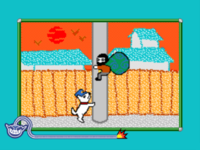 The game begins with a police dog leaning on a lamppost, and a thief on the top of it. The objective of the microgame is to press constantly to make the thief slip down. If he goes down enough until the microgame ends, the player wins. This page was last edited on October 8, 2018, at 22:20.